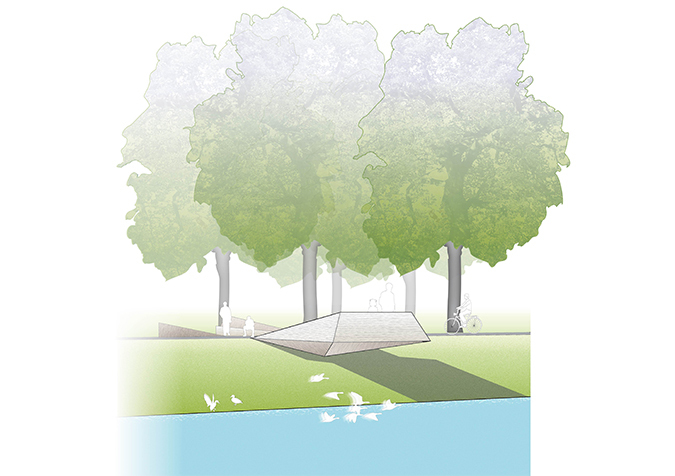 Comprehensive aim of the design concept is the connection of the two historic buildings Schloss Senden and Church St. Laurentius through the existing tree concept, as well as the differentiation of the elongated sections into “triangle squares“ and the “park joint“ as the linked element between city and canal. 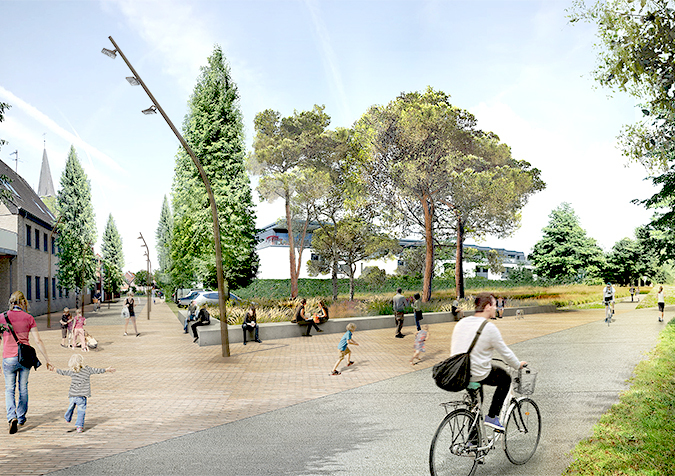 The triangular square acts as a deflection point, bringing the cyclists from both directions equally into the city. The pavement is held in light clinker in long rows, as an locally typical product. The curved "light hinge“ communicates as a new icon of Senden as a contemporary element with the axis line of the chapel and guides with its prompt character into the city center. The “long bench“ supports with its position and shape the movement into the city and frames at the same time the outer edge of the existing private garden. This garden will be integrated as a "reception garden" in the new concept - either to continue under private management and/or within the current urban maintenance. The floating pontoon has the same surface as the triangle square, can be anchored in the harbor temporarily and constitutes an optional component, which brings additional attractiveness to the place especially in the summer months. 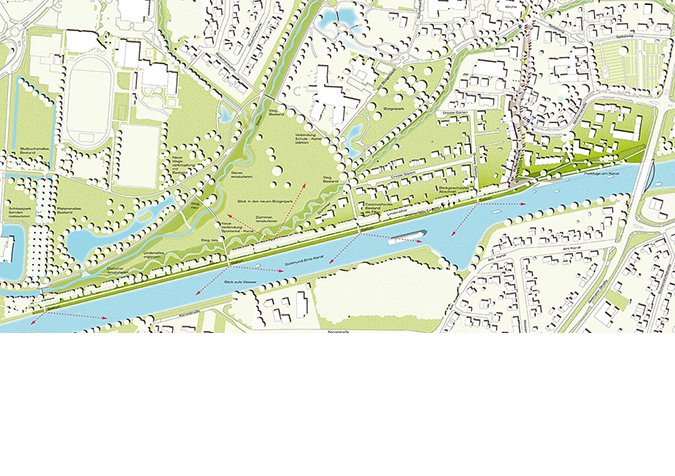 The canal is accompanied by different function strands, which link over the “park joint“ the canal with the housing area. 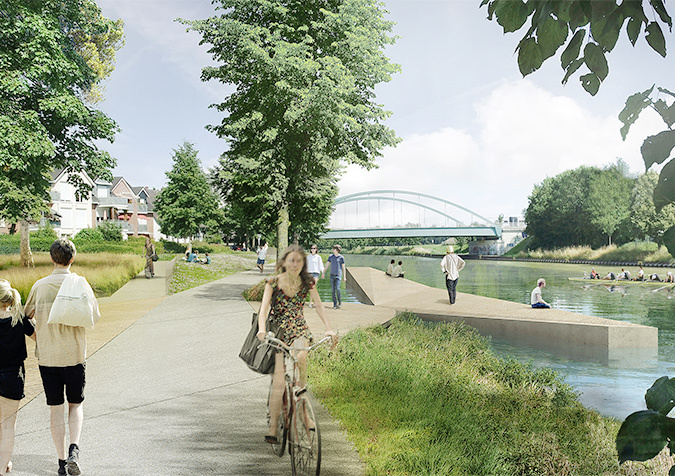 The main function strand follows the canal and takes on the urban cyclists as well as amblers and promenaders. The function strand on the rear side is narrower and more assigned to the residents of the area. The path projects its private and intimate atmosphere and has a decelerating effect on its users. Along the fence line, a gray wood hem (including buckthorn) is used to reduce sight into private gardens. 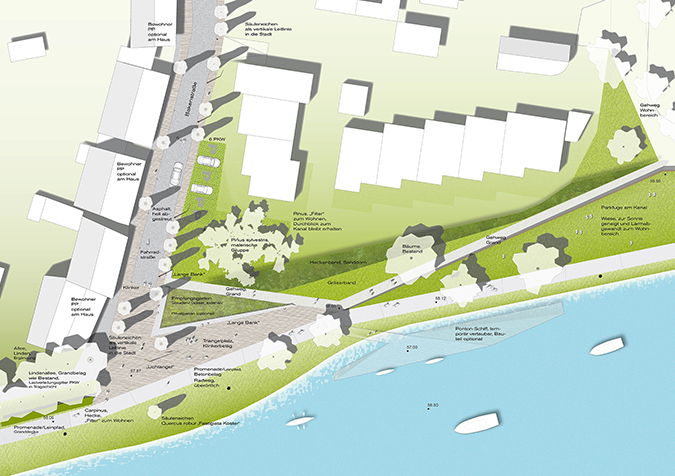 Next to the two function strands is placed a titled lawn area, which functions as a sunbathing area in summer. The tilting of the lawn area is also used to eliminate the noise in the direction of the residential complex. 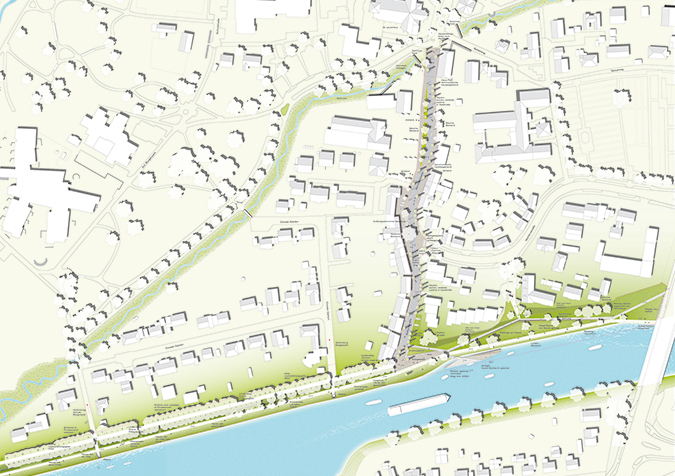 Consulting transport planners: IKS - engineering office for urban and mobility planning.